Like the RESIDENT EVIL , the science fictious film released in 2002 Paul W.S.Anderson maintained his level in this film which be very clearly visible in the theaters tomorrow. In short we can describe this film as a mould of disaster with adventure which clearly has shown in it’s posters “NO WARNING, NO ESCAPE” . In this film a slave turns into a gladiator who actually was in his hard time save his beloved cassia(Emily Browning), who has been unwillingly engaged to a corrupt senator of ROME. As the volacano Mount vesuvius errupts he gives his full commitment to save his true love and did whatever he can do. 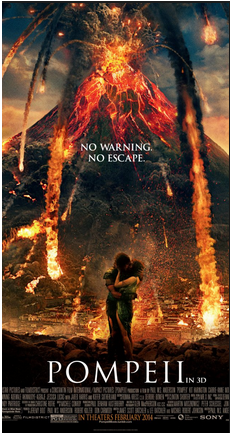 Actually the film POMPEII refers to an ancient city to the southeast of naples in Italy which was totally gone beneath the Earth by a volcanic eruption from Mount Vesuvius in the 79 AD and thus the film which is based on it. As the film is based on a true story so it would be attractive to history lovers and critics said that it may come to the most seen films in 2014. Far apart from the massive eruption from the volcano ans disastrous climatic conditions there are also some sexual content in this movie. In this you can observe the parallels of gladiator and the game of thrones but the only difference is that gladiators are meant for fighting and killing but not to speak soft-hearted English because they ar known for their rudeness. Thus the love shown here is itself a unique one. The only this you can enjoy in this movie is the fighting scenes and catastrophic climatic conditions. A big round of applause is to be given to the film’s visual effect team who have done a great job in creating the catastrophic climatic conditions of volcanic erruption because it is the primary theme of the movie. You can wonderfully enjoy the puffy clouds of co2 gasses to the falling ash just like it seems to be happening in real thus creating a unique atmosphere. Whatever is shown this movie is artificial but the creators has left no effort to make it look real. Only the final eruption seems to be the worse because of its weak conflicts and thus it is no that must as expected to be good. As stated earlier that the movie is based on disaster so you cannot expect any kind of logical explanation or some kind of emotional seens as seen in love storys , though there are emotional moments but it is much based on motivation and enthusiasm .